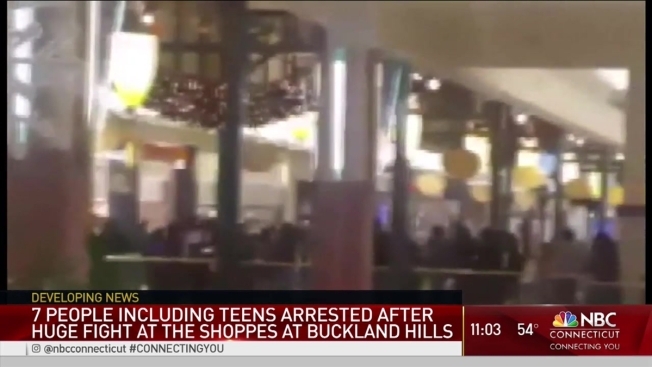 Police in Connecticut have arrested seven people after multiple fights at the Shoppes at Buckland Hills in Manchester. 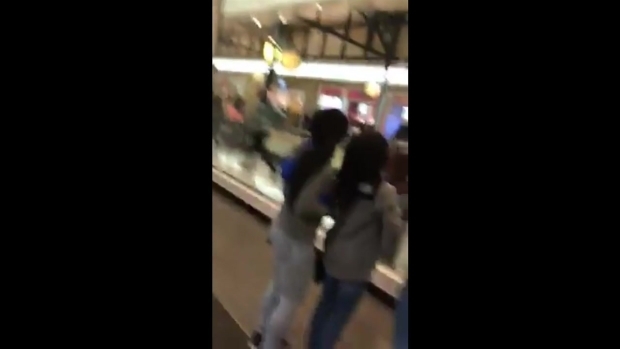 On Monday, Manchester police said up to 10 teenagers were involved in a disturbance at the mall when a fight broke out. Police estimated that several hundred teenagers were in the mall at the time of the original disturbance and other fights started to happen simultaneously. Videos posted on social media purportedly shows hundreds of people leaving the mall or standing in the parking lot. Police said the mall closed after the fights broke out. One Manchester police officer was assaulted while attempting to break up the first fight but did not seek any medical attention, police said in a release. Police praised mall store staff for thinking quickly and closing their security gates to protect customers. Manchester police said Tuesday they made a total of seven arrests, many of them teenagers. Raekwon Gaines, 20, of Hartford, was charged with second-degree breach of peace. Solomon Wilson-Frame, 19, of Hartford, was charged with first-degree criminal trespass, second-degree breach of peace, and interfering with an officer. Police also charged a 15-year-old boy with breach of peace, a 14-year-old boy with breach of peace and interfering with an officer, a 16-year-old boy with breach of peace, criminal trespass, and interfering with an officer, a 15-year-old girl with breach of peace and criminal trespass, and a 16-year-old boy with criminal trespass and breach of peace. Those suspects were all from Hartford and were not identified due to their age. Some mall employees reported thefts taking place during the fight but police have yet to confirm. There were no weapons reported and no indication that the fights were gang related, Manchester police said. Police are looking into the possibilty that the fights were pre-planned on social media. “Looking at the reports throughout the country it appears that most of the fights all started in the food court area involving teenagers. The fact patterns are very similar to ours. There’s certainly the possibility that there’s some sort social media component that started this, but we can’t confirm that,” Capt. Davis said Tuesday. Police continue to investigate and more arrests are possible as police identify other people involved in the fights. South Windsor, East Hartford, Vernon and Glastonbury police all assisted Manchester police at the scene. 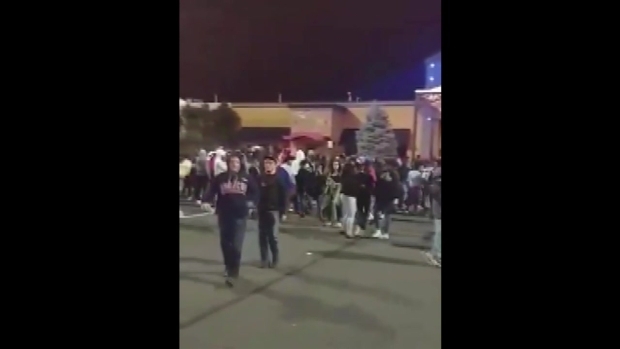 Multiple news outlets reported mall fights breaking out across the nation, including in New Jersey and Chicago.